Up to 60 days before arriving guests may choose 3 rides for FastPass+. You can do this either online or through the My Disney Experience app. You may also choose the time you want to have the FastPass+ for. 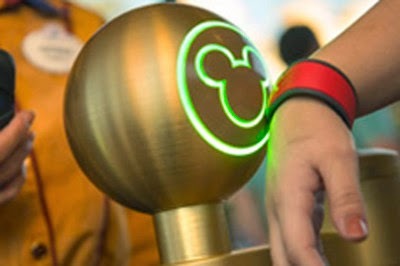 MagicBands are RFID-enabled waterproof bracelets that each guest will wear. They come in a variety of colors (red, orange, yellow, green, blue, purple, grey and pink) and will be shipped to your home before your trip, unless you book your trip within 10 days of leaving and then your MagicBands will be shipped to your resort. Guests will now be able to choose another FastPass+ selection at one of the park's kiosks after they have used their first three FastPass+ selections. 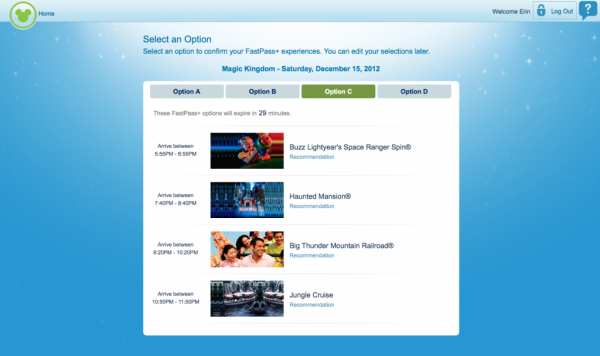 Once guests have used that FastPass+ selection, they can choose another, and so on. *The first three fast passes can be reserved online or through the My Disney Experience app. However, the additional passes can only be booked through the kiosks at the park. *Guests will also be able to use their additional FastPass+ selections when hopping from park to park. *There is no additional cost to use this. It is included with your ticket price. *Some attractions (such as the Frozen characters meet and greet and the new Seven Dwarfs Mine Train) are in high demand. If you want a FastPass+ for these, you MUST book 60 days in advance. *All 3 initial FastPass+ must be used in the same park. If you are park hopping, you make book an additional FastPass+ after you use al three at the first park.